While there are lots of great ways to find all kinds of Indie music online, the same can’t be said for independent bands and artists coming out of the Middle East. In the past few years, the Indie music scene has really taken off, and thanks to Beshr Kayali, you can now discover a little bit more about the music the region has to offer. 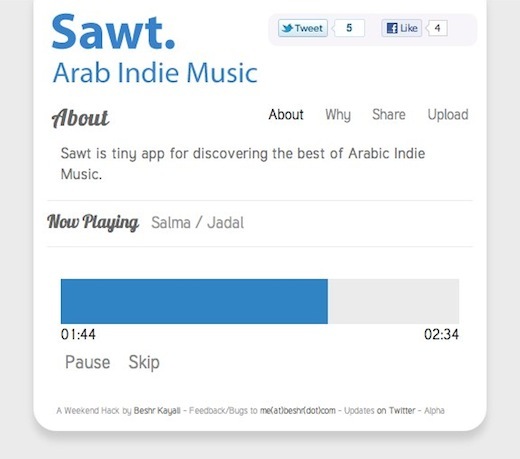 Built as a weekend hack, the minimal web app, Sawt, is a great way to dive right into Arabic Indie music, but as the announcement says, the app still has several features that we can expect in the near future. As it is now, Sawt it is a little player, which allows you to listen to Indie bands from all over the Middle East, displaying the song title and artist, and for now all you can do is skip songs. With bands from Lebanon, Egypt, Jordan and beyond, the actual musical styles are varied, so there’s a little something in there for everyone. The app does have its limitations. For the time being it only works on Chrome and Safari, and there is no way to select music yourself, or keep track of what you’ve heard. So if you hear a song that you like, be sure to make a note of the artist’s name if you want to find out more about them or their music. What it does bring with it’s beta launch is iOS support, meaning you an keep up with some great music on the go. The best thing about Sawt is the fact that it gives an international outlet for bands who might otherwise go unnoticed. Some future features that we can expect include personalized stations, listening history and more. Have you tried out Sawt? Let us know what you think of it in the comments.